In the Strip District of Pittsburgh, there is a spice store called Penzey Spices. · Bay Leaves: These are perfect for adding to a chicken, pork roast, turkey or ham. Use 2-3 leaves and remove after serving. · Baking Spice: Apparently this stuff adds flavor to hot cereals, pancake batter, cake, brownies, muffins, pies and coffee cakes. Add up the spices in the recipe and just use the same amount of Baking Spice. · Celery Salt: Good for roast beef, pot roast, steaks on the grill or in a meatloaf. I prefer this rimmed around a bloody mary! · Cayenne Red Pepper Powder: This can be used in place of whole chili peppers in a barbecue sauce and chilly. · Crushed Red Peppers: I ate some of these tonight! I am obsessed with putting these on pizza, but Penzey also suggests adding them to spaghetti, omelets and beans. · Chili Powder: Great for Mexican dishes. · Cloves: A must for studding hams. · Cinnamon: An essential spice – you can put this in everything you bake and even some things that you drink – like hot chocolate! Cinnamon sticks are also great for stirring hot drinks! · Garlic: I won’t tell you what to use this for because it is gross. LOL. · Jerk Pork Seasoning: Great for Jamaican-style pork chops or tenderloin on the grill. · Mustard: Traditionally used for pickling, canning and sausage making. · Black Peppercorns: According to Penzey, if there is one spice that should be in your kitchen, it should be pepper. It adds the greatest amount of flavor to dishes! · Lemon-Pepper Seasoning: Most commonly used to season fish. · Oregano: Put this on baked chicken, pork and fish. It can also be added to a simple salad dressing or marinade. · Paprika: Adds a flavorful, colorful touch to meat, fish and poultry. · Keep whole spices for four years and ground spices for two. 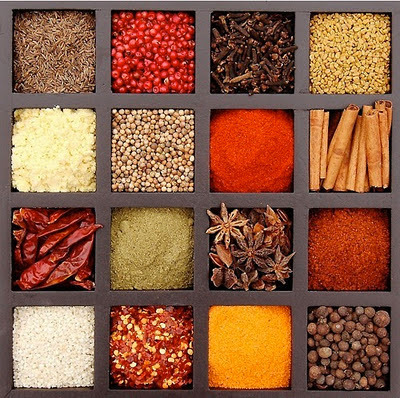 · Do NOT store your spices near a heat source – on top of a fridge, stove, dishwasher, microwave or sink. Also keep your spices out of direct sunlight.